It appears that at some point since our last report, the southerly limit of the ice exclusion zone has been lowered further - it is currently down to 40°N 45 between 52°W19 and 48°W24. Right now the boats are closing on its western end. Yesterday belonged fully to Team Brunel. In second place to Abu Dhabi Ocean Race at midnight yesterday, by 0355 the Dutch VO65 had edged into the lead and between then and the following sched at 0656 UTC, she had managed to put a critical two and a half miles on Ian Walker's team and managed to increase this to 5.5 miles by 09:50 - these gains likely to have been due initially to a combination of getting into a favourable Gulf Stream eddy with the resultant extra pressure and then sailing into more wind through being further east. But the big gain for Team Brunel came in the afternoon. As the wind crapped out for the boats behind so Bouwe Bekking's crew managed to hang on and by 1600 she was 24.8 miles in front, which in this tight contest might be considered a race winning lead. In this hiatus, Jean-Luc Nelias on MAPFRE chose to dive south, a move that caused the Spanish team to overtake Abu Dhabi Ocean Racing and pull into second as Team SCA and Dongfeng Race Team dived north in search of pressure. Overnight the boats have been heading just north of due east on starboard tack in around 10 knots of breeze with Brunel sailing into less pressure and the others slowly closing, second placed MAPFRE back to being 11.1 miles off the lead at 01:02 UTC this morning. Overnight all the boats have erred north of the great circle to the western end of the ice exclusion zone's southerly limit, but Brunel has been defending her place, maintaining the most southerly position. However the remainder of the fleet to the north has benefitted from a vital two knots more pressure and as a result at the latest sched MAPFRE has closed to 5.5 miles off the lead with Abu Dhabi Ocean Racing a further two miles behind in third, followed by Team Alvimedica fourth, less than a mile behind Ian Walker's team with Dongfeng Race Team and Team SCA respectively 11 and 17 miles behind the leader. The inward concertina-ing is likely to continue to a degree today as Brunel continues to sail into less pressure in the meteological void to the north of a depression and to the east of the bottom end of a front associated with a depression currently centred to the north of Newfoundland. There appears to be just enough wind to propel the boats along the southern extremity of the ice gate before a trough develops in this area by tomorrow morning. Beyond this, the forecast indicates that the Azores high will be parked right over the great circle to Lisbon and this will force the boats to make a significant detour to the north around its favourable side. What a great feeling! The Atlantic Ocean is calm; there is 10 knots of wind from the northwest. It’s midnight. Below deck, Jens Dolmer is sitting down, eating a bag of steaming porridge. Outside, the sky is full of stars. But it’s the sparkling lights straight behind us that should gladden the crew’s hearts more. Neatly arranged in a row from left to right are the red and green top lights of MAPFRE, Dongfeng Race Team, Abu Dhabi Ocean Racing, Alvimedica and Team SCA. Bouwe Bekking has just crawled out of his bunk and gazes at Andrew Cape’s screen with satisfaction. Through sleep-filled eyes, he sees that his Team Brunel is in first place. “Tonight I trimmed the mainsail,” laughs Capey. The entire crew radiates confidence. As usual, they don’t admit it, but now you can feel it. Two days ago, things did not look quite so rosy. Just as in the previous two legs, we got little from the first 24 hours. In fact a couple of blunders immediately after the start sent us to the back of the fleet. “Great. There we go again!” I thought. However, over the next 36 hours, Bekking & co gloriously dispelled the first wrong assumption – the boat’s lack of speed. In the first night, Alvimedica and Team SCA were swept aside and we also made rapid inroads on the leads of the other three boats. It was only when we were close to the top three that our catch-up lost momentum. “What’s happening?” asks a sleepy Louis Balcaen as he comes on deck for his watch. He was also on deck an hour ago for a sail change but suddenly everything has changed. The wind has dropped. Abu Dhabi Ocean Racing is now 50 metres to windward and Dongfeng Race Team and MAPFRE are drifting around in entirely different positions than before. The ladies and Alvimedica are also close to us again. “It’s a madhouse,” whispers Rokas Milevičius. “Wind holes, running and standing still.” And just as he is saying that, the elements see fit to illustrate it. A strong gust of wind suddenly sets Team Brunel in motion and brings us 100 metres past Abu Dhabi Ocean Racing. And then the wind drops again. The sails flap. Now it’s the turn of Ian Walker’s men to get a gust, which brings them back alongside us. 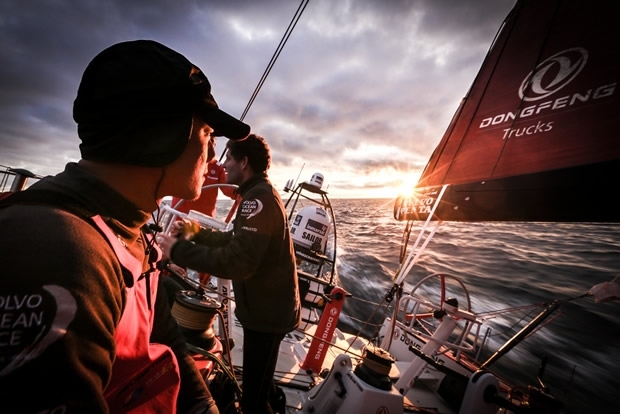 But the Arabs and Team Brunel seem to be better served than Dongfeng and MAPFRE, because Abu Dhabi and we are creeping away from them.The second wrong assumption is next to go – that team Brunel cannot handle transition zones. Little by little, gust by gust, Team Brunel now sails away from its biggest rival. Below deck, Jens Dolmer and Timo Hagoort are shifting the stack as if their lives depended on it. To the front and back again... and then again... and again. For once, Arrarte is not cracking Spanish jokes. He is standing bolt upright at the helm and concentrating fully. Today, every gust is for him!